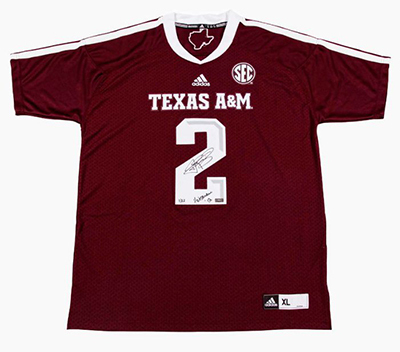 Johnny Manziel has signed an exclusive autographed memorabilia deal with Panini Authentic. Going forward, the deal makes Panini the only place collectors will find things like signed photos, jerseys and football. The agreement is a multi-year deal. Panini already has a selection of items available. The card maker also announced that Manziel will have autographed trading cards in all of their 2014 products. He will also be featured on card packaging and promotional materials, starting with 2014 Score Football. It is important to note that the exclusive part of the deal extends to memorabilia and not trading cards. Manziel, the 2012 Heisman Trophy winner, joins a growing stable of Panini Authentics exclusives that includes Andrew Luck, EJ Manuel, Kobe Bryant, Kevin Durant and Blake Griffin.